CATCHING UP: Cruising fashionably, the resort | cruise fashion shows continue to be a welcome jolt of vaca-driven freshness in sinc with the weather getting warmer. 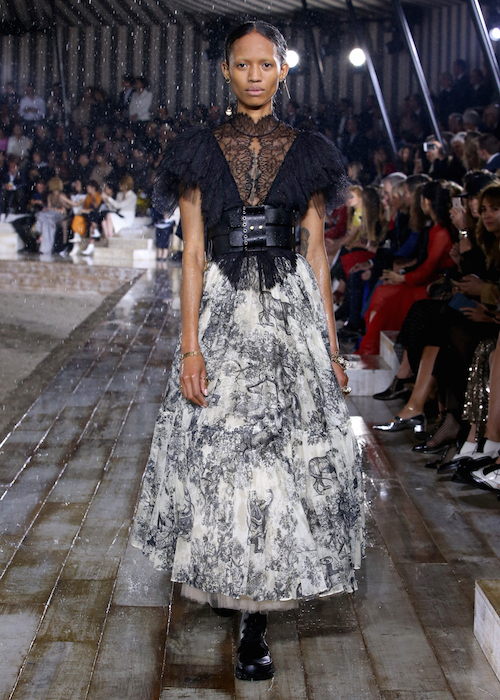 Though this season’s horse-driven Dior Cruise 2019 presentation created a different buzz with Paris Jackson having a moment (decked in Dior) at the show. Here’s another look at her stunning multicolor patchwork dress, alongside other babes Olivia Cooke, Natalia Dyer, Anya Taylor Joy, Alexandra Shipp, Billie Lourd, Grace Van Patten, Florence Pugh, Daria Strokous, and Nat Wolff, all wearing Dior at the Dior Cruise 2019 Ready-to-Wear Show. A peek at few favorite looks from the runway at DIOR CRUISE 2019. Paris Jackson wore a Dior multicolor patchwork dress and “Defile Summer” bag with rainbow strap. Olivia Cooke wore a Dior white embroidered blouse with white wool and silk crepe shorts and skirt. She also wore Dior shoes and a “Pochette” printed clutch. Natalia Dyer wore a Dior white embroidered bustier dress and black wool coat. She also wore a Dior beret, Dior boots and a Dior saddle bag in “Peace and Love” patchwork. Anya Taylor Joy wore a Dior ivory silk dress. She also wore “Walk’n’Dior” sneakers. Alexandra Shipp wore a Dior black leather dress. She also wore Dior gold studded booties and a Dior saddle bag. Billie Lourd wore a Dior black embroidered dotted tulle dress. She also wore Dior shoes and a Dior bag. Grace Van Patten wore a Dior black silk top with a black leather caged skirt. She also wore Dior “Surreal-D” shoes and a Dior clutch. Florence Pugh wore a Dior black silk dress. She also wore a “J’adior” bag. Daria Strokous wore a Dior black tulle dress with a red lacquered lambskin trench coat. She also wore Dior shoes, a Dior choker and a Dior bag embroidered with red and black threads. BABES at DIOR cruise 2019 commentary by brigitte segura. more pics from the DIOR show coming soon. photo credit: getty | Dior. group by estelle hanania | Dior. Make-up Peter PHILIPS for Dior.